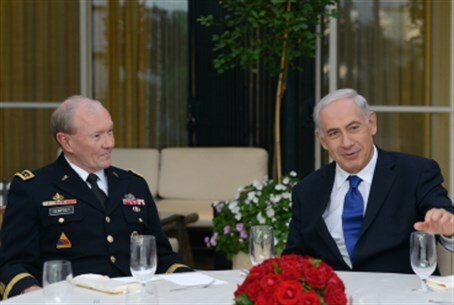 General Martin Dempsey notes ongoing security pact with Israel, hails Jewish state as 'example of what could be' in the Middle East. Top US military leader and chair of the Joint Chiefs of Staff, General Martin Dempsey, said on Monday at a regional summit of international business executives in Washington that the US would still back Israel in the event of a strike on Iran. According to the International Business Times, Dempsey noted that the US still has a 'deep obligation' to Israel in the event of a military conflict with Iran. Dempsey declined to give details, but emphasized that the two countries still have a special alliance during this period of heightened tensions in the region. "That is why we are in constant contact and collaboration with them," he confirmed. CNN notes that Dempsey also credited Israel with being "an example of what could be" in the Middle East. "If we had one of my Israeli counterparts sitting here, they would tell you that most of the Arabs living in Israel have a better life than the Arabs living in the rest of the region and that is true," he said. Dempsey's remarks follow a public falling-out between Israel and the US, over different opinions regarding a nuclear Iran. The US and Israel are also butting heads after US Secretary of State John Kerry's visit this month to broker more peace talks between Israel and the Palestinian Authority turned into a diplomatic disaster, with Kerry calling Israeli building in Judea and Samaria "illegitimate" and making threats of a "third intifada" if talks fail. Relations between Israel and the US have only downturned in the past week, as Kerry and Prime Minister Binyamin Netanyahu reportedly were unable to agree over an appropriate date for the US official to visit Israel again and attempt to resume the floundering peace negotiations. Amid the diplomatic crisis, Netanyahu has been looking to other countries for support in preventing the deal. French President Francois Hollande remarked during his visit this week that France is working vigilantly to prevent a deal with Iran from being accepted by the international community; and on Wednesday, the PM is expected to visit Russia to appeal for support from Moscow. Talks between Iran and the so-called P5+1 nations are expected to resume in Geneva on Thursday, November 20.